Ammo Up Ammunition Picker Upper Easy-to-use Ammo Picker Uppers are a must-have for the gun enthusiasts! No more back-breaking clean up and no more missing half of your spent ammo! Utilize our magic finger design and watch as Ammo clean up becomes simple! Easy-to-use Ammo Picker Uppers are a must-have for the gun enthusiasts! No more back-breaking clean up and no more missing half of your spent ammo! Utilize our magic finger design and watch as Ammo clean up becomes simple! 8" Mini Ammo Up Models- For all your ammo clean up needs! 18" Ammo Picker Uppers with extra large collection basket- less emptying! 36" Push Ammo Picker Uppers with double wheels and double baskets for extreme Ammo situations! 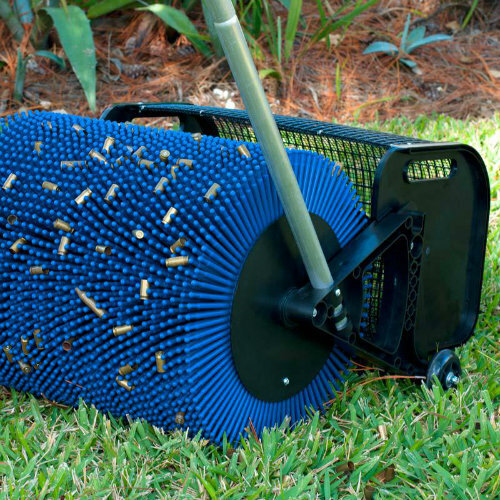 36" Pull-Behind Ammo collector easily attaches to riding mower, ATV or golf cart-- quickest ammo clean up out there!